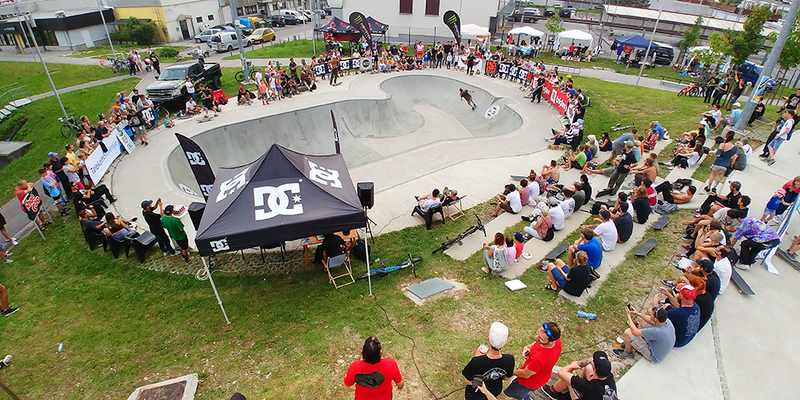 Flowgrind 2018 was six different events during four days of skateboarding; Best Line, Best Bowl, Women Street, Men Street, AM Street and Double Set Best Trick contests. Best Line happened in the center plaza of Nova Gorica; Switzerland’s Simon Stricker hit it the hardest, with flip-in and flip-out of every trick. ​​​​​​​Canada’s Andy Anderson and Argentina’s Sandro Moral both destroyed the bowl, winning the cash. Poland’s Agata Halikowska killed it in the skatepark and won the Women’s Street category. Sweden’s Kristoffer Kroon got 1st in AM Street contest. Argentina’s Matias Dell Olio was on fire the whole weekend and got 1st in the Men Street contest and also won the Double Set Best Trick with a Switch Kickflip BS Lipslide. Good times everyone, thank you for coming through and see you next year! Monster Energy, DC Shoes, Telekom Slovenije, Jessup Griptape, Obsešen, 19.91 Denim, Shoe Goo, Sugar Skate Co., Graw Jump Ramps, Wicked Audio, Hotshot Handle, Embisi Skateboarding, Kult Eyewear, Rolka Skateshop, Relax Crew Skate Co., Keitre Skateboards, Fingerbear Fingerboards, Nox Clothing, SGB Tatuaggi, Reservoir Dogs Brewery, The Boardr, Ride Channel, Perla, Casinò & Hotel, Triglav Group, E3 Energy Ecology Economy doo, T-NET doo, AGM, A-media, Arctur doo, Leone Ice Cream and Concrete Skate Parks.